With Ots Studio you are able to convert your Media files into the Ots file format. You can either: convert an individual file into a single item Ots file, or convert multiple files into a single Ots Album file -- one file consisting of multiple items. This feature is great for merging your single files into the original album format. Note: If you wish to convert a large number of Media files to Ots files you can use the Ots Studio Batch Conversion Utility. You can configure the Convertor to batch process your Media files overnight. See here for more information. Note: Ots Studio will extract the Title and Artist information directly from the filename (not from any ID3 tags). You should have your files named in accordance with the industry standard of Artist - Title.ext. If your filenames are not listed in this way, but your ID3 tags are accurate, you can use a batch filenaming tool, such as Dr.Tag, to rename your files based on the ID3 content. To learn more about getting your folder and filenames setup, see here. Tip: As an alternative to the process explained below, you can right-click on the Media files you would like converted in Windows Explorer and select the Convert to Ots Album file option. Click on the button to create a new Ots file. Click on the Add Files button and navigate to the file(s) you wish to convert. 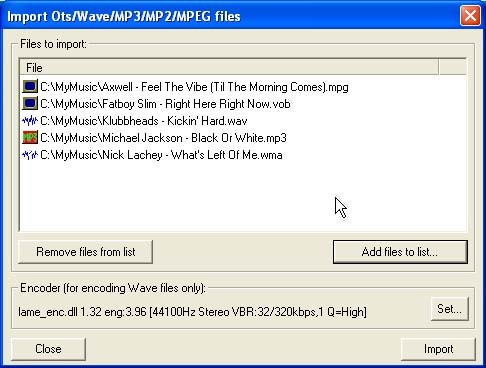 Tip: If you are importing Wave or non-MP3/MP2-based audio streams, make sure you have selected the correct encoder settings (uncompressed PCM is also an option). Click on the Set button to adjust encoder settings. Click on the Import button. Ots Studio will begin importing the files you have selected. Note: Wave, MP3, MP2, MPEG1 and MPEG2 files (including VOB and TS) are automatically supported within Ots Studio. Other Media types can be imported provided you have the relevant DirectShow filters installed on your system. For more information, see here. Once the import operation has completed, you will be presented with the Operation Summary dialog box that indicates the outcome of the operation. You can choose to view a detailed log at this point if you so desire. You will see the tracks that you have imported in the main Ots Studio window. From here, you can further edit the file if necessary. For details on editing your files click here. To save the Ots album file click on the button on the Ots Studio toolbar. You will be prompted for an Album Title. Enter the Album Title into the Chunk Details/Edit text input box. Click on the button again, navigate to where you want to save the file, and click on the Save button in the Save Ots file dialog box. Tip: If you wish to add extra tracks to the Ots file click here for details. Tip: If you wish to remove a track from an Ots file, simply right-click on the item and select the Delete option.